The U.S. Fish and Wildlife Service and Island Conservation are pleased to announce that operations to restore Desecheo Island’s native species and their habitat by removing non-native, invasive black rats from Desecheo Island have been completed safely and successfully. CABO ROJO, Puerto Rico – The U.S. Fish and Wildlife Service and Island Conservation today announced that operations in March and April to restore Desecheo Island’s native species and their habitat by removing non-native, invasive black rats from Desecheo Island have been completed safely and successfully. The removal of invasive rats will allow the native forest to recover and will promote the recolonization of the island by several seabird species that historically nested there. Beginning March 13, 2012, the Service and Island Conservation successfully carried out the first aerial application of rodent bait in the Caribbean to remove destructive rats from the island and surrounding islets, while minimizing threats from the bait to other animals. Intensive monitoring took place prior to and after the bait application, from February to April to assess the effectiveness of the operations. Two years of additional monitoring will take place before the island can be officially declared free of destructive invasive rats. The Desecheo National Wildlife Refuge, part of the Caribbean Islands National Wildlife Refuge Complex, is a small, uninhabited island located approximately 13 miles west of Puerto Rico. The refuge was established in 1976 to protect seabird colonies. Historically, Desecheo Island was a major seabird rookery and it may have had the largest brown booby colony in the world, with estimates of up to 15,000 breeding birds in the early 1900s. Surveys in 2009 revealed no breeding seabirds and, in 2010, only a small number of birds were recorded nesting on the coastline and offshore islets. The loss of nesting seabirds on the island has been linked to the presence of introduced predators, including invasive black rats. In addition to seabirds, Desecheo provides habitat for six endemic species (three lizards, three arachnids) and the Federally Threatened Higo chumbo cactus. The island also supports subtropical dry forest, an important habitat type that is endangered on the mainland of Puerto Rico and in other subtropical areas. Black rats were first reported and collected from Desecheo in 1912, at which time they were already abundant. Black rats are native to the Indian subcontinent, but are now widespread as an invasive species around the world. The removal of introduced species from wildlife refuges is critical to the restoration of wildlife habitat and the protection of threatened species. 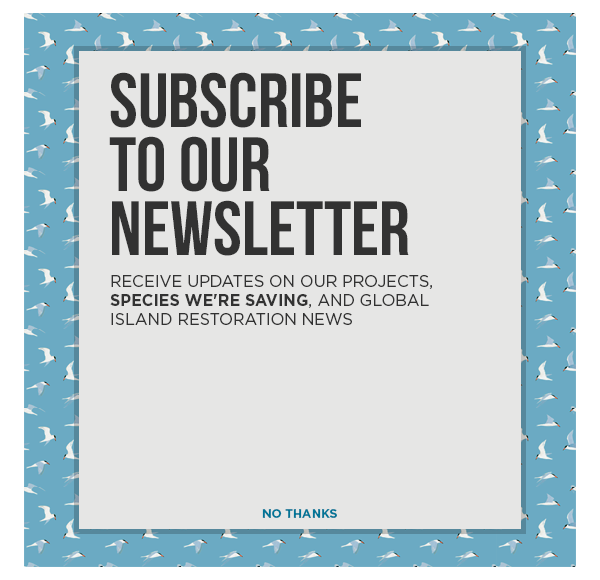 ·Island Conservation, a nonprofit organization dedicated to preventing extinctions by removing invasives species from islands, is a partner with the Service in the plan to restore Desecheo Island by removing non-native rats. Please visit Island Conservation’s website at www.islandconservation.org. ·The U.S. Fish and Wildlife Service is the principal Federal agency responsible for conserving, protecting and enhancing fish, wildlife, and plants and their habitats for the continuing benefit of the American people. Please visit the Service’s websites at http://www.fws.gov/caribbean/refuges. ·Funding for this project has been provided by the U.S. Fish and Wildlife Service and Island Conservation through many private donors, including the David and Lucile Packard Foundation, and U.S. Federal funds allocated through grants for wildlife conservation. ·A detailed fact sheet about the project is available here.